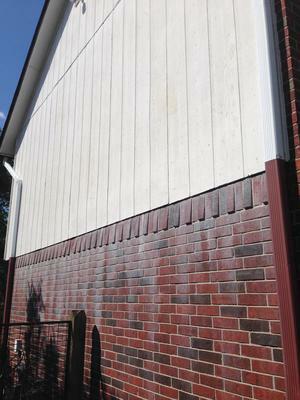 I have a two story house with a wretched hardboard siding and brick combination. The hardboard covers both floors in back and the upper floor on each side. Brick is across the front both stories and on the lower floor on each side. I want to replace the hardboard with corrugated galvalume in a rain screen design. I had considered painting the brick on each side because is it stained with paint chalk from the siding above (very difficult to remove) and the brick is dark red which is inappropriate for the south (too much heat gain). I read your comments about painting brick and now I wonder if there is a better path. What if I extended the rain screen down from the upper story over the brick and then applied the steel cladding all the way from top to bottom? Yes the brick would be trapped, but it would be covered by a quality house wrap and the steel siding. Seems like this would work just fine, what do you think? Might have to add furring strips to deal with some brick protrusions, but that's about it. Brick is a great exterior surface. I'd hate to cover it up, and that one course with the protrusions adds character to the home. I don't know how well it fits the siding you plan on using, but I hate to cover up brick. If the brick can't be cleaned then painting is a viable option unless you know you have water infiltration problems. In a sense what have you to lose. If you discover that the paint has caused a problem then you can side over it.